A most charming and lovely city in the Czech Republic Olomouc is located on the Morava River This is the country’s fifth largest city and its center is the largest historic preservation zone outside of Prague. It has cobblestone streets, wonderful cathedrals, beautiful parks and palaces. Olomouc plays host to many different festival all through the year. In May you can be part of the largest beer festival in the country, there is a ten-day city festival in June and in September the International Organ Music Festival. Visitors enjoy seeing the Astronomical Clock. This is one of two astronomical clocks found in the Czech Republic. It was modeled after the social-realism style that was popular during the Communist era. People like seeing its mechanical performance daily at noon. This clock is part of the town hall building on Horni namesti or Upper Square. Don’t pass up the 900 year old St. Wenceslas Cathedral. It dominates the city skyline and has the tallest spire in Moravia. You can see the current and former archbishop’s palaces. For strolling and relaxing Olomouc has a ring of parks. When the city walls were demolished these separated the old town from the new. A branch of the Morava River runs through Bezruc Park. Here you can also find several defense towers that can be climbed. The botanical gardens are within the parks, there are greenhouses, and the nearby zoo has over 50 endangered species in protection. The zoo also includes an amazing giant shark aquarium. There are interesting public sculptures to see like the Holy Trinity Column on the main square which is on the UNESCO World Heritage Site list. 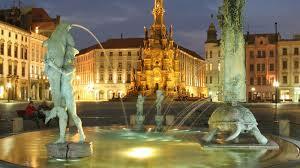 The city also has six Baroque fountains which can be found around its two main squares. To the delight of visitors there is now a seventh modern fountain on Horni namesti or Upper Square. So come and visit this most interesting city. You’re sure to enjoy what you see.